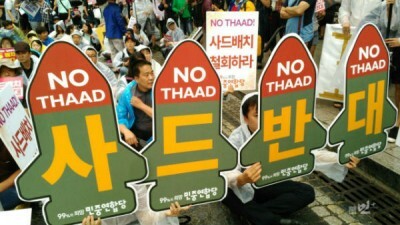 South Korean women protesting the deployment of the Terminal High Altitude Area Defense (THAAD) system is aimed not to defend them against North Korea, but as a threat to Russia and China, analysts told Sputnik. Namhee Lee was a signatory of the Women Cross DMZ group’s letter to President Donald Trump on Wednesday calling on him to defuse military tensions and start negotiating for peace to prevent war from erupting on the Korean Peninsula. North Korea’s missiles are short-range SCUDs with a range of 500 km (300 miles), medium-range Rodong 1s with a range of 1,300km (780 miles) whereas THAAD is most effect for long range and high altitude missiles, the professor said. “THAAD is not effective against the SCUD missile. THAAD is effective against the Rodong 1, but this missile is not developed to aim against South Korea, rather it is aimed against Okinawa,” she said. Namhee Lee noted the X-bend radar that is integrated with a THAAD system is able to detect missiles at a range of 1,000-5,000 km (600 miles to 3,000 miles). “Many of China’s missiles can be detected by THAAD’s X-bend radar,” she stated. Deploying THAAD’s radars also posed health hazards for the people of South Korea, the historian explained. “Many are also afraid for the health and safety of people living nearby, especially from exposure to radiation from the systems’ powerful radar emissions. Especially Seongju residents who feel that the decision to deploy THAAD was made without their input and without independent health assessments,” she also remarked. Radar emissions coming from THAAD will cause a great deal of harm to people living close by. “Those who live within the radius of 100 meters would face the danger of losing lives, and those living within the radius of 3.6 km (six miles) would experience dizziness and vomiting,” she noted. The protest is the last resort for the Koreans to show that they are opposed to the government’s decision to deploy the THAAD system, she observed. University of Illinois International Law Professor Francis Boyle told Sputnik he was deeply concerned about the danger of war breaking out on the Korean Peninsula. “Right now, I am seriously worried that Trump is going to launch a criminal and catastrophic war against North Korea,” he said. Such a conflict would violate the UN Charter, the War Powers Clause of the US Constitution and Congress’s 1973 War Powers Resolution, Boyle added.